We look forward to welcoming you to our University this summer for Jazz in July 2019! We have an exciting and enriching event planned and can't wait to have you join us. Details about on-campus residence hall lodging and meal plans can be found both below and in the tabs above: please take a look and contact us at registration@umass.edu or 413-577-8102 with any questions. To complete your registration for lodging and/or meal plans, click Register Now above. We offer participants the opportunity to reserve on-campus housing in a traditional UMass residence hall, conveniently located within walking distance to the Music Department. Common lounge areas encourage guests to continue the immersive Jazz in July experience, while single or double occupancy rooms allow each guest a private space to prepare for the next day's activities. Click the Housing tab above for more information. Check-in is typically available from 2 - 10PM on your day of arrival, and check-out is by 2PM on your day of departure. The Residence Hall Orientation Meetings will be held on Sunday, July 7, and Sunday, July 14, at 8PM in the residence hall. 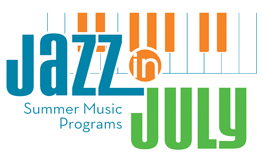 Residential students are required to attend one of these meetings, but all Jazz in July participants are welcome. Rates are below and include a linen pack (two sheets, a pillow with case, a blanket, and two towels). Recently named "Best Campus Food" by the Princeton Review for the second year in a row, UMass Dining invites you to join our table! Meal plans are available in a conveniently located, award-winning UMass dining commons. Meal plans are mandatory for participants under the age of 18 who stay in an on-campus residence hall. Meals are served cafeteria-style from 7AM - 8PM each day. Click the Meal Plan tab above for more information. Participants are encouraged to register and submit payment on or before June 21, 2019. All registration/payments received after June 21, 2019, will be assessed a $40.00 late fee. Please note that early registration is strongly recommended: participants registering or paying on-site (space permitting) will also be charged this late registration fee, and availability on-site cannot be guaranteed. Housing and/or meal plan cancellations received by the close of business (5 p.m. EST) on June 28, 2019, will receive a refund less a $60.00 cancellation-processing fee and any administrative fees. There will be no refunds for cancellations received after June 28, 2019. Attendees that need to cancel housing and/or meal plans should send a written cancellation notice to the UMass Conference Services Registration Office at registration@umass.edu.